LAKSHADWEEP.NOV.11. 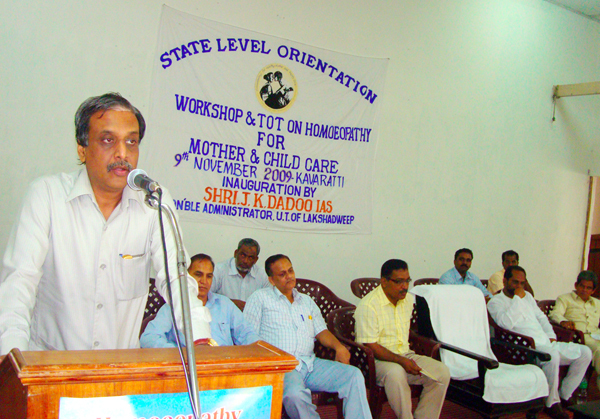 Union Territory of Lakshadweep launched the State campaign on Homoeopathy for Mother and Child Care Dr. K.P. Hamzakoya, Mission Director (NRHM), Lakshadweep welcomed the gathering The campaign and the work shop were inaugurated by the administrator of Union Territory of Lakshadweep, J.K. Dadoo IAS, Dr.T.N.Sreedhara Kurup, Deputy Director I/c, Central Research Institute, Kottayam delivered the keynote address. Shri. Marnya Ete, IAS, Secretary (Health), Lakshadweep, Dr.K.R Mansoor Ali., Dr. M.C.Sanil Kumar, Dr.P.P.Muthu Koya, also spoke on the occasion. Dr.N.P.Cheriya Koya, proposed vote of thanks. On this occasion translated copies of four posters, 8 handouts and a booklet on “Homoeopathy for Mother and Child Care- An Overview” were released.